WHERE: The Mobtown Theater, 3600 Clipper Mill Road in Baltimore. TICKETS: $15 general admission/$12 students and seniors. Tickets are available at the door, or in advance at Brown Paper Tickets. 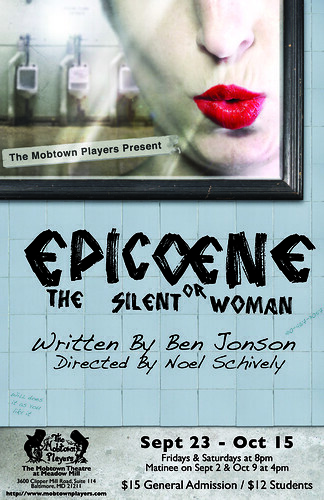 Championed by John Dryden as “the pattern of a perfect play,” Epicoene was penned by Ben Jonson—the second best playwright of the 17th century. Morose has decided to get married and thus cut his nephew, Dauphine, out of his will. The problem? He can stand NO NOISE and must have a demure—and quiet—bride. Trouble is, he’s having a hard time finding one. So Dauphine and his friend Truewit conspire to produce the eponymous Epicoene, just such a silent woman. When the musicians, a gaggle of women, Jack Daw and La Foole (two foolish knights), Cutbeard the barber dressed as a Doctor of Canon Law, and a quarrelling Mr. and Mrs. Tom Otter “crash” the nuptials, will anyone survive the wedding day? And if so, will Dauphine get the money? The production is directed by Noel Schively, who cofounded the Mobtown Players in 1997. A Ben Jonson fan, he also directed the Mob’s 2004 production of the writer’s best known play, Volpone, which City Paper called “highly charged and ambitiously conceived.” He also directed the 2007 hit A Servant of Two Masters. For Epicoene, Schively has assembled an extensive cast that includes thirteen local actors.